Former UFC middleweight champion Michael Bisping announced Monday on his “Believe You Me” podcast that he is retiring from mixed martial arts. Bisping entered the sport in 2004 when it was still primitive and came up at a time when the UFC was exploding in popularity. After ten professional fights, Bisping competed on the third season of “Ultimate Fighter” as one of the favorites. On the series that featured Ken Shamrock and Tito Ortiz as coaches, Bisping secured a UFC contract by defeating Josh Haynes at the finale in June 2006. Competing at light heavyweight, Bisping had early success in the promotion but it was a split decision loss in his first pay-per-view main event against Rashad Evans that prompted Bisping to cut down to the middleweight division. It was at 185 pounds he saw his greatest triumphs while separating himself from most fighters with his willingness to play the arrogant heel and engage in conflict to heighten interest in his fights. Bisping returned to the “Ultimate Fighter” as a coach in 2009 opposite Dan Henderson, which became a heated rivalry, culminating with a devastating knockout by Henderson at UFC 100 in July 2009. Throughout his career, Bisping had the knock of failing to win “the big one”, falling short of a championship title match on three occasions. The first was the loss to Henderson at UFC 100, in January 2012 he dropped a razor-close decision to Chael Sonnen where the winner was set to fight Anderson Silva for the middleweight title, and then lost to Vitor Belfort in January 2013 in another fight that would have likely secured a title fight and opened the door for Chris Weidman to fight Silva instead. After losses to Tim Kennedy and Luke Rockhold in 2014, it seemed that Bisping would be relegated to a certain class of competitors who would never challenge for the championship. Bisping came back from the Rockhold loss with wins over C.B. Dollaway, Thales Leites, and Anderson Silva to revive his career. His golden ticket came in June 2016 when an injury to Chris Weidman, opened the door for Bisping to receive a middleweight title fight against rival Luke Rockhold on 17 days notice. 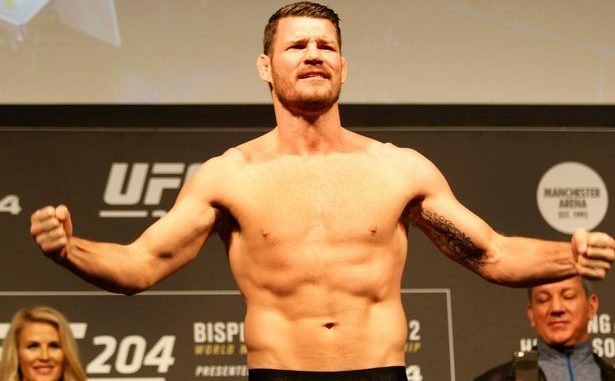 Bisping accepted the fight while in Toronto filming a movie and pulled off the enormous upset, stopping Rockhold in the first round of their UFC 199 main event at The Forum in Inglewood, California. Bisping defended the title once, avenging his loss to Dan Henderson at UFC 204 in October 2016 and dropped the title one year later to Georges St-Pierre at UFC 217 at Madison Square Garden. In a questionable decision in hindsight and foresight, Bisping decided to take a fight with Kelvin Gastelum just three weeks after the loss to St-Pierre and was knocked out in 2:30 last November. Bisping cited vision problems as well as feeling he had nothing left to prove as the deciding factors behind the decision to retire. Bisping fought an incredible 29 times in the UFC and retires at the age of 39.